The Abbotsford Heat came to Abbotsford in 2009 in a 10-year deal involving taxpayer-guaranteed revenue for the team. The announcement was made on Tuesday at a press conference at the Abbotsford Entertainment and Sports Centre. Apr. 15, 2014 5:00 p.m. The Abbotsford Heat’s financially challenged five-season tenure in this city is coming to a close. At a press conference on Tuesday morning at the Abbotsford Entertainment and Sports Centre (AESC), Mayor Bruce Banman announced that the City of Abbotsford will pay the Calgary Flames $5.5 million to terminate the remaining five years of the 10-year supply fee agreement signed in 2009 to bring the Flames’ American Hockey League affiliate here. The agreement guaranteed the Heat a break-even annual budget of $5.7 million. Over the first four years of the deal, local taxpayers paid $5.24 million to cover financial shortfalls. The contract-ending payout does not include a projected deficit of roughly $2 million for the current 2013-14 season. So all told, the Heat will end up costing Abbotsford taxpayers about $12.7 million. Losses totalling $11 million were estimated for the final five years of the contract. “There is absolutely no question in our minds that taking this step with the Abbotsford Heat is the best scenario financially for the city and our ratepayers,” Banman said. The city said the contract buyout will be covered by 2014 operating savings and unappropriated reserves, and there will be no property tax impacts. The Heat will depart at the conclusion of the Calder Cup playoffs. Upwards of 20 front-office staff members were informed Tuesday morning that June 30 will be their last day of work. Glens Falls, New York has been recently rumoured as a destination for the Heat, but Flames president and CEO Ken King said there are multiple options. “I appreciate that city administration and taxpayers stood up to their (contractual) obligation,” King said. “And our return for that was not extending the pain or anxiety with that. That’s as good as we could do … to essentially permit the agreement to be terminated. As part of Tuesday’s announcement, the city unveiled a three-pronged strategy, entitled “A New Game,” to guide the future of Abbotsford’s 7,000-seat arena. The initiative includes establishing naming rights partners and new revenue-positive anchor tenants; renegotiating management agreements with arena operator Global Spectrum; and improving community access to the facility for amateur sports. Banman said he’s unsure whether the city will be able to land a new hockey anchor tenant in time for the 2014-15 season. “We would look forward to any franchise or any league that wants to have discussions … keeping in mind that it has to be revenue-positive for the taxpayers,” he said, noting that he’s open to overtures from other AHL franchises or the Western Hockey League (major junior). The Heat struggled to draw fans throughout their time in Abbotsford. They rank 29th out of 30 AHL teams in attendance this season with an average crowd of 3,007. That’s down from 3,778 last season. The Heat played their final home game of the regular season on Sunday, and they will begin their playoff run next week. Season ticket-holder Gary McCaskill, co-chair of the Heat Booster Club, said he’s “saddened” the team is leaving. Jordan Bateman, B.C. director of the Canadian Taxpayers Federation, lauded the city’s decision to buy its way out of the Heat contract, calling the previous agreement “corporate welfare for a very wealthy hockey club, the Calgary Flames. “Abbotsford taxpayers shelled out about $12.7 million in this five-year span,” he said. “That’s a lot of cops; that’s a lot of road repairs; that’s a lot of sewer and water infrastructure that could have been built. Part of the Heat’s struggle to establish themselves in Abbotsford was the fact the Flames are a division rival of the local NHL franchise, the Vancouver Canucks. The Canucks engaged in negotiations with Abbotsford last spring after purchasing the AHL’s Peoria Rivermen from the St. Louis Blues, but talks broke down and they ended up moving their farm team to Utica, N.Y. He believes that buying out of the Heat contract is better than the deal they could have struck with the Canucks last spring. “We’ll see what the future brings with regards to the Canucks,” he said, noting that he’s not privy to details of their agreement with Utica. Lane Sweeting, a member of the Fraser Valley Sports and Entertainment group which operated the business side of the Heat on behalf of the Flames, said the demise of the Heat was due to a number of factors: the contentious Plan A referendum to approve the arena’s construction; taxpayer dissatisfaction over the supply fee agreement; the unpopularity of the Flames affiliation; the economic downturn; high travel costs; and the difficulty of marketing back-to-back home games against the same opposing team. “It’s obviously a disappointing day for all of us,” Sweeting said. “But by the same token, I don’t think the tide’s going to turn (for the Heat’s attendance). 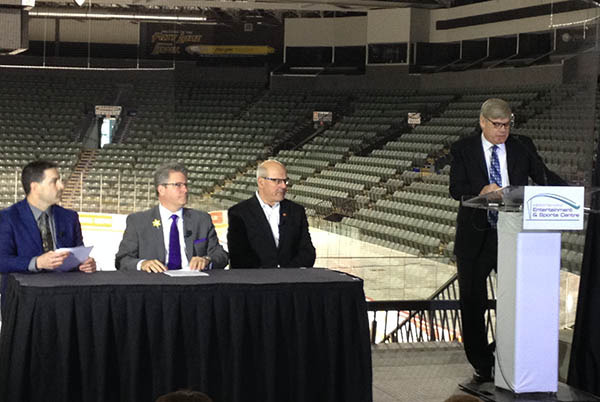 Speaking at the press conference this morning at the Abbotsford Entertainment and Sports Centre are (from left) Dean Clark of Global Spectrum, Mayor Bruce Banman, Calgary Flames CEO Ken King and Abbotsford Heat president Ryan Walter.